Passive house certification means that the Schuco FW 50+.SI and FW 60+.SI systems can now be used to build aluminum facades to the passive house standard. Only Schuco can provide systems of this type. The newly developed SI (Super Insulation) versions of the FW 50+ and FW 60+ aluminum mullion/transom constructions impress with their trend-setting system details. The new type of isolator design uses innovative materials to reduce energy losses to a minimum. 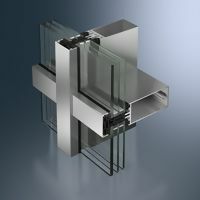 Inward-facing reflective surfaces on the pressure plates also contribute to the outstanding Uf value of up to 0.14 Btu/(hr·ft²·F°), including screw factor. The system achieves this value for the passive house-certified version with a glazing thickness of 48 mm. As part of certification by the Passive House Institute, the system met the passive house comfort criterion of Ucw < 0.14 Btu/(hr·ft²·F°) and was certified as fulfilling the passive house standard with outstanding thermal insulation. This value was calculated and certified by the PHI in accordance with the latest criteria for certifying facade systems, using triple insulating glazing (Ug = 0.12 Btu/(hr·ft²·F°)) with a facade module of 1.20 m x 2.50 m. In addition to the effects of the pressure plate fixings, the impact of the glazing supports has also been taken into account for the first time. "The certification has been achieved in the main thanks to an excellent value for the screw factor," explains Professor Wolfgang Feist from the Passive House Institute in Darmstadt. "In addition, it uses a high-quality spacer and the losses at the glass edge are markedly reduced by means of the glass fiber-reinforced plastic pressure plate. The low thermal conductivity of the pressure plate is also a reason for the minimal impact of the screw factor. 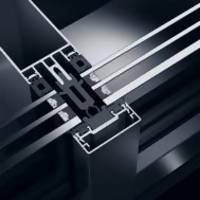 Stainless steel has been used for the glazing supports; its thermal conductivity is considerably lower than that of aluminum. The glazing rebate area is filled with very well insulated polypropylene foam." Download 2019 CURTAIN WALL PRODUCT CATALOG [pdf 0.5MB].